Rockwell: Life on a Palette, a new musical based on Norman Rockwell’s covers for the Saturday Evening Post, will receive a staged reading in New York City on January 10 and 11, 2013. With book and lyrics by Eleanor Albano and Anthony Barnao, and music by Ron Abel, this reading of Rockwell will be directed by Glenn Casale. 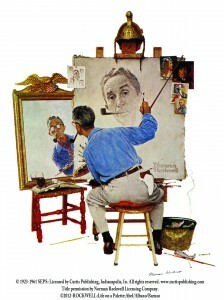 Norman Rockwell’s stories transcend color and time. His work is undeniably successful by any measure … popularity, longevity, commerciality, and mass appeal. Rockwell: Life on a Palette will bring Rockwell’s stories into a brand new arena, musical theatre. From ragtime innocence through the roaring 20s, to the tap dancing 30s, World War II big band and swing, Broadway show tunes, a rousing gospel chorus, and contemporary country, Rockwell has a score that reflects the sounds of the entire 20th century. Featured in January’s staged reading will be (in alphabetical order) John Davidson (Broadway credits include State Fair and Oklahoma! ; he is currently appearing off-Broadway in The Fantasticks), André De Shields (Broadway’s Ain’t Misbehavin’, Joe Turner’s Come and Gone, Play On!, The Wiz, The Full Monty), Kevin Earley (Broadway’s Les Misérables, Death Takes A Holiday, Thoroughly Modern Millie, A Tale of Two Cities), Sean Hankinson (Bat Boy at Musical Theatre West, The Sound of Music at Actors Co-op, and Emmy Award nominee for the WB series Prom Queen), Nancy Opel (Memphis, Fiddler on the Roof, Triumph of Love, Anything Goes, Tony Award nominee for Urinetown), and Ryann Redmond (who recently made her Broadway debut in Bring It On!). Eleanor Albano (book & lyrics) has been a theatre marketing and advertising design consultant for regional and commercial houses in Los Angeles since 1983. Other writing credits include the stage musical It’s A Jungle Out There and the TV series The Music Shoppe, and with Dale Gonyea, the animated musical holiday fable Christmas Is For Everyone. Anthony Barnao (book & lyrics) is the founding artistic director of the highly acclaimed Blue Sphere Alliance, a Los Angeles theatre company known for presenting new work. He has directed numerous original plays, including award-winning productions of The Big Voice (moved off-Broadway), Home Sweet Hell, a hip-hop version of A Midsummer Night’s Dream, and In the Bargain starring Catherine Keener. Ron Abel (music) is a multi-award-winning composer, producer and musical director who has composed the scores for Bricktop, Re-Introducing Laurette Bishop, the award-winning Twist of Fate, and the upcoming Hazel. Abel has worked with Jessye Norman, Taylor Dayne, Lucie Arnaz, Michele Lee, and Valarie Pettiford, among many others. On Broadway, Glenn Casale directed Peter Pan starring Cathy Rigby (Tony Award nomination). Off-Broadway, his work includes The Property Known as Garland, and Dragapella at Studio 54 (Drama Desk and Lucille Lortel Award nominations for Best Production). He recently directed Disney’s The Little Mermaid and Beauty and the Beast in the Netherlands, Germany, Italy, Spain, and Russia. Casale is the Artistic Director of California Musical Theater in Sacramento. The January staged reading of Rockwell will also have, as part of the creative team, choreographer Patti Columbo, who has Broadway, national tour, and regional credits including Peter Pan (with Casale), Dr. Doolittle, Seussical, the Musical, Seven Brides for Seven Brothers, On the Town, Can-Can, and White Christmas. This staged reading is presented by Pisces Productions with the permission of Curtis Publishing, Inc., and Norman Rockwell Licensing Company. Stage manager is Bonnie Panson, and general management is by Bespoke Theatricals. The staged readings of Rockwell: Life on a Palette will be on Thursday, January 10 at 4pm, and Friday, January 11 at 11am and 4pm, in New York City. For more information and reservations, email info@bespoketheatricals.com, or call (212) 221-1122, ext. 110. The Pasadena Playhouse (Sheldon Epps, Artistic Director and Elizabeth Doran, Executive Director), announces the final week of performances for A SNOW WHITE CHRISTMAS, through December 30 only. This inaugural production of the new Panto at The Playhouse holiday series has been playing to nearly sold-out houses and has become the season’s new hot family entertainment ticket. An updated version of the classic tale, in the style of a traditional British family Panto, A SNOW WHITE CHRISTMAS features family-friendly magic with a comedic twist, dancing (with “So You Think You Can Dance” alumni), a live miniature pony, and contemporary music from Katy Perry’s “Firework” to Huey Lewis and the News’ “Power of Love” to Michael Jackson’s “Thriller,” and more. A Panto is known for its interactive style and humor that appeals to everyone from ages 2 – 102. Beginning 90 minutes before every performance, audiences are invited to enjoy a “Winter Wonderland” event in The Playhouse’s Engemann Family Courtyard, complete with holiday music, crafts, activities, games and photos with Santa. Lythgoe Family Productions produces fun, musical theatre the whole family can enjoy. Known for their creativity and involvement in television hits “American Idol” and “So You Think You Can Dance,” the Lythgoes are dedicated to bringing affordable theatre to families across America. Based on the Grimm fairytales, each story has been modernized with topical scripts for parents and well known pop songs for kids. The Lythgoes pride themselves on creating a memorable experience the whole family can share. The cast for A SNOW WHITE CHRISTMAS features Ariana Grande, Neil Patrick Harris, Charlene Tilton, Curt Hansen, Jonathan Scott Meza, and David Figlioli. In addition to director Bonnie Lythgoe, the creative team for A SNOW WHITE CHRISTMAS includes choreography by Spencer Liff (Emmy nominee for “So You Think You Can Dance”), musical direction, additional music, and arrangements by Michael Orland (“American Idol”), book by Kris Lythgoe, scenic and costume design by Lythgoe Family Productions creative department, with additional costume design by Julia Clancy, Donna Maas and Kleev Guessford, additional scenic design by J.J. Wickham (LFP producers include Kris Lythgoe, Bonnie Lythgoe, Becky Baeling and Jason Haigh-Ellery). A SNOW WHITE CHRISTMAS will play through December 30 only. The performance schedule is as follows: Monday 12/24 at 11am and 3pm; Wednesday 12/26 at 7pm; Thursday 12/27 at 3pm and 7pm; Friday 12/28 at 3pm and 7pm; Saturday 12/29 at 11am, 3pm, and 7pm; and Sunday 12/30 at 11am and 3pm. Single ticket prices for A SNOW WHITE CHRISTMAS range from $32.00 – $72.00, with Premium Seating available for $100.00. Child single tickets are available for Rear Orchestra and Rear Mezzanine seating ranging from $22.00 – $47.00. Family ticket packages are available at $99.00 (weekday performances, Rear Orchestra), $159.00 (weekday, Front Orchestra/Front Mezzanine; weekend, Rear Orchestra) and $199.00 (weekend and Christmas Eve, Front Orchestra/Front Mezzanine). Golden Tickets are available as an add-on to any child’s ticket for an additional $100.00 each and are limited to 10 Golden Tickets per performance. A Golden Ticket allows the ticket holder (children only) a special on-stage experience during the production. Admission to the “Winter Wonderland” event is complimentary to all ticket holders, and begins 90 minutes before every performance. Service and theatre restoration fees apply to all purchases. Tickets are available by calling The Pasadena Playhouse at 626-356-7529 or by visiting The Pasadena Playhouse Box Office, www.PasadenaPlayhouse.org. Group Sales (8 or more) are available by calling 626-921-1161. The Pasadena Playhouse is located at 39 South El Molino Avenue in Pasadena. For additional information, visit www.PasadenaPlayhouse.org.